Update: The Nextbit Robin is a smartphone that promises something different from the standard smartphone offering. Just looking at it is enough to tell you that. While our reviewer wasn't exactly sold on its marquee feature, the dynamic onboard-to-cloud storage solution, you can't argue that Nextbit's debut isn't an all-around attractive package. And there might be a slick, red version of the Robin on the way, too. The specs are solid, its feature set and build quality are each up their with the best Android phones available today. And now, it's more affordable than ever. Down from the already-decent asking price of $399 (around £270, AU$560) for a totally unlocked device, you can now nab the Robin for $299 (about £226 and AU$400). And, before you ask, the Robin has been confirmed to support Android Nougat when it releases in just a few months. According to a forum post by an Nextbit employee, the incoming update will hone in on improving battery life, which was another key area that we felt the Robin didn't nail completely. While it's unfortunate that a CDMA version of the phone was cancelled around the time of the phone's launch, the Robin is shaping up to be one of the most alluring (and more affordable) Android N-compatible phones out there. We're standing by for the Nougat update and will update this review with all of the fresh details when it arrives in the autumn. There are thousands of smartphone models out there, and for the most part they all look much the same, and operate in much the same way. The Nextbit Robin is different – it looks different, and with cloud storage baked into its very OS it works differently too. Even the way in which the phone came into being is different, with the fledgling company taking to Kickstarter to fund it. And seemingly there's a market for 'different', as Nextbit raised $1.36 million, despite only asking for $500,000. Nextbit claims the Robin never runs out of space, and that's its real hook. The phone backs up not just photos but even apps to the cloud, and it does so seamlessly whenever you're short on space. The phone debuted at an asking price of $399 (around £270, AU$560) but it has since been reduced to $299 (about £226 and AU$400). That mid-range price puts the Robin up against the likes of the OnePlus 2 and Moto X Play. It has a solid assortment of specs for the money too, including a 5.2-inch 1080p screen, a Snapdragon 808 processor, 3GB of RAM and a 13MP camera. So on paper, it's more than just a one-trick pony. It's a strong sales pitch, and for a no-name brand coming into such a crowded market that's vital. There's some serious talent behind the design of the Nextbit Robin: it was dreamt up by the man who created the HTC One M7 and HTC One M8. To my mind those are two of the most beautiful phones ever made – so when I first laid eyes on the Robin I have to admit to being a bit disappointed. There's none of the premium metal or comfortable curves found on HTC's masterpieces; instead the Nextbit Robin is a slab of polycarbonate – or rather several slabs joined together. My review unit came in a mint colour, although that only applies to the buttons and panels of plastic above and below the 5.2-inch screen, while the bulk of the back and sides are white. The colourful, plastic design leaves the Nextbit Robin looking almost like a toy, and the boxy style means it doesn't sit all that comfortably in the hand – but at least it's a lot more grippable than it looks, as the plastic isn't at all slippery. And, for better or worse, the Robin does look different. You wouldn't mistake this for any other phone, and I like that about it. Little details add to this distinctive look, such as the circular dual front-facing speakers and the four little lights on the back that spring into action when the Robin is uploading things to the cloud. The buttons look different too, although not necessarily for the better. On the right edge you'll find the power button, which also has a fingerprint scanner baked in. The scanner is ideally positioned, and as fast and accurate as you'd hope, but the button itself is slightly indented, making it harder to find by touch than if it jutted out. It's a similar story with the volume buttons on the left edge. The small, circular design is unusual, but again this makes them hard to hunt down. The rest of the Robin looks fairly standard. There's a sizeable 5MP camera on the front, a 13MP snapper on the back, a headphone port on the top edge and a USB-C port on the bottom, flanked by a notification light. 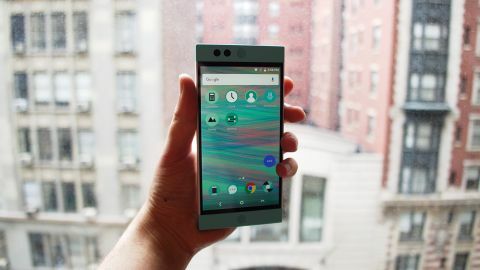 Ultimately, I'm not totally sold on the design of the Nextbit Robin. Even within this sort of price range I'd take the looks of the OnePlus 2 over it any day (especially once you've added a custom back to that phone). But I like how bold the design of the Robin is; it feels gutsy, and I'd choose it over most plastic phones. It's not a handset that will necessarily impress people, but it will intrigue them. Expect to get a lot of questions and comments on it.